I know, I know. Considering it’s been dangerously hot out for the last week baking doesn’t seem quite like the thing to do. Thankfully Paul doesn’t mind that I keep the AC set to 70. There’s been so many zucchini from the garden and there’s local peaches for sale at our Whole Foods Market, so I was itching to do something. Plus my computer got virused and I couldn’t get online for a few days. Not that I honestly have wanted to do anything while it’s been this hot other than lay around and nap (the pool water’s been into the 95 range, so we can’t even swim) , but I couldn’t let all this goodness go bad. 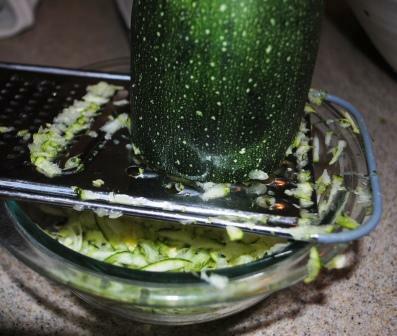 First up was a twist on plain ol’ Zucchini Bread that I found while wandering around Pinterest. Fortunately I am also swimming in an abundance of eggs so I got to use of some of those as well. 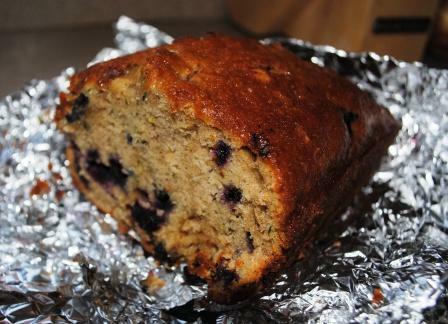 Grated zucchini plus plump fresh blueberries in a sweet and cinnamon-y batter. Yum! I can tell it’s awesomely good, but I can’t tell you much more because Neve’s barely let me have any. Clearly it’s excellent summer snacking for the 8 year old crowd. 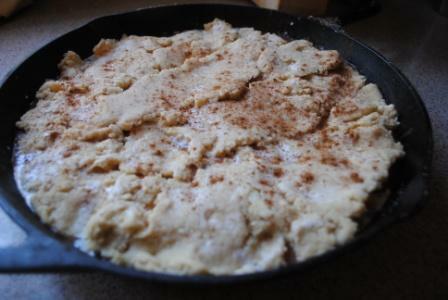 Next up is Peach Cobbler from a Country Living article a summer or two ago. It’s made in a cast iron skillet, which I find incredibly charming and rustic in a fruit dessert. 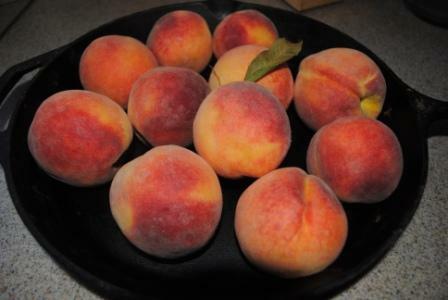 You can go right to the recipe by clicking on it above, but basically you get a bunch of fresh peaches, scald them in boiling water to soften them up a bit and make the skin slide off nice and easily. 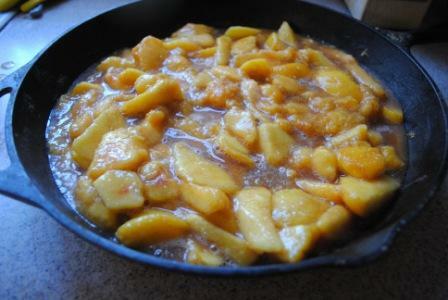 You make a luscious topping with your dry ingredients (plus a hint of dried ginger) and toss your sliced peaches in a bowl with sugar and vanilla. I added a bunch of cinnamon as well. Throw it in the oven and bake it and enjoy the magnificent aromas that will fill your kitchen. Then it will disappear with alarming speed, I guarantee. Just like peach and zucchini season will disappear before we know it as well. So go forth and enjoy the fruits of summer while they last! 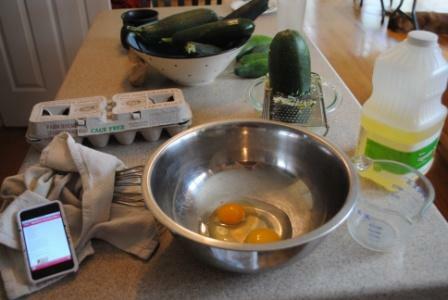 This entry was posted in Uncategorized and tagged food, Garden, Seasons. Bookmark the permalink.